The Orion Nebula. 02-07-2019. Urban Sarasota. 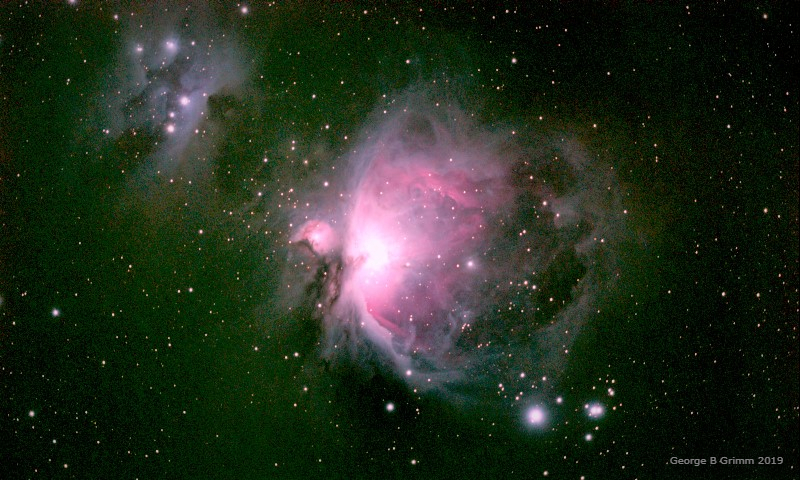 The Orion Nebula, catalogued as Messier 42 or NGC 1976, is one of the brightest nebulae in the sky, and one of the nearest star-forming regions to Earth. It is rewarding in telescopes of every size, and is perhaps the most studied and photographed object in the sky. M 42 is visible to the naked eye as a hazy patch surrounding Theta Orionis, the middle star in the Sword of Orion, just south of Orion's Belt. SkyWatcher SW120ED Refractor. SkyWatcher AZ EQ5 GT mount. Orion .8x focal reducer. Nikon D3100. 30 images each 60 seconds, stacked in DSS and enhanced in GIMP. Description above from SkySafari.